May we say glass for this 9 light chandelier that has satin nickel framing with 2-layer lampshades: clear glass shade with metal rim that then surrounds a matte hand blown opal glass interior shade. Sophia Features a graceful and pleasingly look. Geometric Framing Balances. This fence like design, circles the hanging stem form the ceiling. Then the rounded Opal Glass Shades surrounding the framing. A fixture that will illuminate a grand room. Available In Satin Nickel And Oil-Rubbed Bronze. 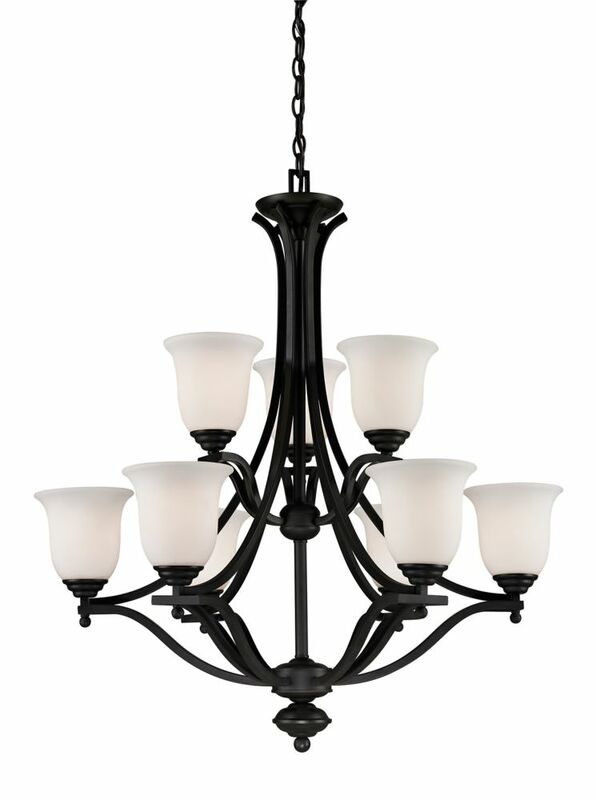 This Commercial Electric chandelier features a satin bronze finish and opal glass shades. This simple, elegant design compliments any interior dicor. These fixtures are built with steel to last. They can be easily installed, with hardware included. 9-Light Matte Black Chandelier with Matte Opal Glass - 31.75 inch This chandelier will update your home with its eye-catching design. Featuring a matte black finish and matte opal shade(s), this fixture will accommodate a variety of dicor styles. With its easy installation and low upkeep requirements, this chandelier will not disappoint.